in 2016 with a “back to basics” approach of tire treads and shoe leather, the group announced earlier this week. The announcement was made at the group’s January meeting, held at the firehouse at 56th and Narragansett. More than 40 men and women, mostly GRNW members, turned out on one of the coldest nights of the year. Cacciottolo said that while GRNW members patrol year round, at different times on all days of the week, relatively few of the group’s 110 members are currently patrolling. He chalked that up to complacency caused by Garfield Ridge’s relatively low crime numbers, which he said are even lower than they were five years ago. “Our members who are not currently patrolling need to get active again—during the day, the evening, walking, jogging, riding your bike, walking your dog, in your car. We need to be out in the streets to be extra sets of eyes and ears for the police,” he said. He also called upon Garfield Ridge residents who are not GRNW members to open their eyes and ears, as well, and call 911 promptly to report anything suspicious. Those who are not comfortable calling 911 are encouraged to call the GRNW’s tip line at 1-855-811-TIPS (8477) to report situations that may need attention. Doherty, noting that the group provides guidance. She added that GRNW members on patrol look for and report much more than what may be crimes in progress. Members look for things that are suspicious, like open garage doors, as well as “quality of life” details that need to be called in and addressed—like graffiti, burned-out streetlights, potholes, obstructed street signs and more. about believing information posted on Facebook and other forms of social media. As an example, he said that something initially reported over the scanner as gunshots turned out to be a car backfiring, but the unfounded rumor about gunfire persisted for days in the neighborhood. digits with a sub-zero windchill, the firehouse at 56th and Narragansett was warm inside. It also was friendly, thanks to firefighters who cooked and served hot chili for GRNW members and guests. The CFD crew also bought and served coffee and dessert. The appreciative GRNW audience applauded their efforts, and several individuals shared tales of local firefighters and paramedics going above and beyond the call of duty to serve the people of Garfield Ridge. A 44-year-old Ohio woman employed by Southwest Airlines was robbed at gunpoint as she walked down a sidewalk in front of 4500 W. 59th St. at 3:45 a.m. Monday, Jan. 11. The victim told police that two men approached, flashed a handgun and demanded her phone. When she said she did not have one, they checked her pockets and stole $35 cash and fled east. The victim then walked to the airport and contacted police. 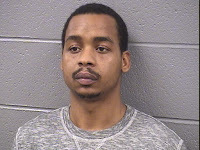 The offenders were described as Hispanic men—one thin and wearing glasses, the other with a heavier build and a goatee, wearing a Chicago Blackhawks shirt. If you live in and/or own a business in CPD Beat 811 and want to help prevent crime in Garfield Ridge (west of Central Avenue), please attend the next meeting of the Garfield Ridge Neighborhood Watch, set for 7 p.m. Monday, January 18 at the CFD firehouse at 56th and Narragansett. 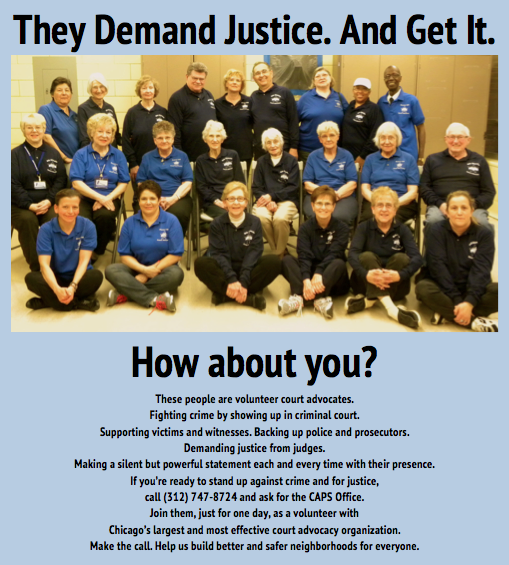 The GRNW is one of Chicago's most active and effective citizen-led crime fighting groups. This is the group to join! This month's guest speaker is longtime Garfield Ridge resident Ed Leighton, who will share his experiences after having completed the Citizens Police Academy Training program offered by CPD. Overflow parking available in the Kennedy High School parking lot, a half-block to the south of the firehouse featured topic is fire safety. Those in attendance are in for a treat, literally, as they sample genuine CFD chili cooked in the firehouse by firefighters. 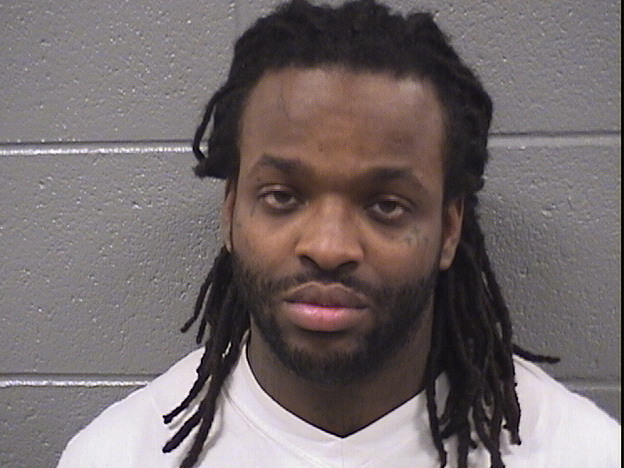 Two men robbed the Boost Mobile store at 8337 S. Pulaski at 11 a.m. Wednesday, Jan. 13. A 19-year-old clerk told police that the men entered, posing as customers but one soon brandished a pistol and ordered her to hand over her personal cell phone, which she did. They also stole an unknown amount of cell phones from the store, as well as $200 cash from the register. They then ordered the clerk to lie down on the floor; but she refused, saying she was pregnant. The robbers ran out the back door and were described by the clerk as black men age 16-28—one about 5-foot-7 and 150 pounds, the other about 5-foot-11 and 160 pounds, both wearing dark clothing. A 17-year-old West Lawn boy was robbed at gunpoint by a quartet of men at 3:15 p.m. Monday, Jan. 11, as he waited near 56th and Tripp for his parents to pick him up from school. The victim told police that the robbers asked him about gang affiliation, and when he said he is not in a gang, they snatched his iPhone and sped away in a red Chevy Aveo. They were described as Hispanic men age 18-19. A 20-year-old West Lawn man told police that three men tried to rob him at gunpoint outside his home near 68th and Lawndale at 12:20 a.m. Thursday, Jan. 14. The victim told police he was getting out of his vehicle when three men in a gray truck pulled up and demanded his belongings and asked him if he was in a gang. The man replied that he was not in a gang but merely coming home after work. He told police that he then successfully ran away and that the offenders drove away without firing a shot. Descriptions of the offenders were vague. Want to work directly with Chicago Police to prevent crime in your neighborhood? 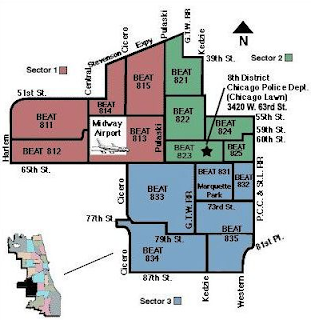 If you live in Beat 811 (see map), come to Good Shepherd Presbyterian Church at 7:00 p.m. Tuesday, January 19 and attend your monthly CAPS meeting. Hear updates on crime in your neighborhood and learn how you can work with neighbors and police to make the community safer and better for all. Bonus: 14th Ward Alderman Edward M. Burke is scheduled to attend and address concerns about crime in the beat. Burglars forced open the service door of a garage near 48th and Kildare and stole three air compressors, a snow blower, a press sure washer, a lawn mower, two power drills, two air conditioners, a vacuum cleaner, two nail guns and two propane tanks. The crime was discovered by the victim, a 35-year-old man, at 6 a.m. Friday, Jan. 15. Burglars broke the locks off the service door of a garage near 63rd and Kolin and stole assorted tools, luggage, clothes, shoes and four auto tires. The crime was discovered by the victim, a 46-year-old woman, at 11 p.m. Wednesday, Jan. 13. Burglars pried open the service door of a garage near 63rd Place and Oak Park, broke into a vehicle parked inside and stole an automatic garage door opener. The crime was discovered by the victim, a 33-year-old woman, at 6:45 a.m. Thursday, Jan. 14. Tracks in the snow indicated that the burglars were going from garage to garage on the block, the victim told police. Burglars forced open the service door of a garage near 52nd and Sawyer and stole four speakers and a motorized wheelchair. The crime was discovered by the victim, a 26-year-old man, at 3:30 p.m. Wednesday, Jan. 13. Burglars entered a garage near 56th and Newcastle and stole two snow blowers. The crime was discovered by the victim, a 61-year-old man, at 10 a.m. Tuesday, Jan. 12. Burglars entered the rear door of a home near 85th and Tripp and stole a laptop computer, three pairs of Nike Air Jordans, a video game console, a DVD player and a gold necklace. The crime was discovered by the victim, a 31-year-old woman, at 8 p.m. Tuesday, Jan. 12. Burglars forced open the service door of a garage near 48th and Komensky and stole a weed trimmer, a snow blower, an air compressor and a box of tools. The crime was discovered by the victim, a 45-year-old man, at 9 a.m. Monday, Jan. 11. A 66-year-old man coming home from church with his wife was kicked to the ground by two men during an argument over parking. The crime occurred at 6:10 p.m. Saturday, Jan. 9 behind the victim’s home neat 64th and Pulaski. The man told police that he knocked on a nearby door—where a party was underway—to ask if people there would remove two cars parked on his property. After asking a man to move his car, the victim turned away and was kicked in the waist. He fell to the ground and was kicked again by another man. Both then fled the scene, and the victim called 911. The attackers were described as Hispanic men age 21-24, 5-foot-11 and 180 pounds, with black hair and dark complexions. The victim refused medical attention, police added. 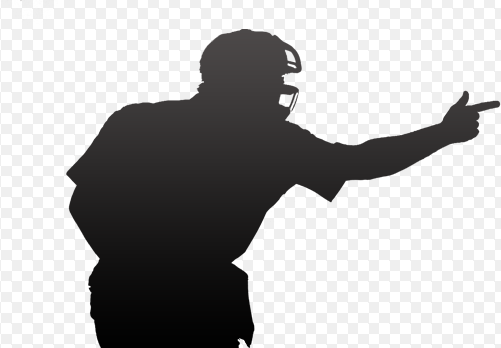 A 41-year-old man delivering food for Domino’s Pizza, 5401 S. Harlem, was punched in the head and robbed at gunpoint by two thugs as he attempted to make a delivery in the 5100 block of South Sayre at 4:30 p.m. Wednesday, Jan. 6. The victim told police that he was approached by a man exiting a dark blue Ford Mustang, and the man claimed it was his pizza and asked if the driver had change for a $100 bill. When the driver pulled out his cash wad to see, the offender grabbed a $20 bill and punched him in the head. At the same time, a second offender got out of the Mustang, holding a pistol. When the victim tried to run away, he was struck in the shoulder by the gun. The two criminals then stole his pizza, got in the Mustang and sped away east on 51st Street. Both were described as Hispanic men age 18-21 with medium complexions. One was about 5-foot-1, and the other was about 5-foot-11. A 58-year-old Oak Lawn woman trying to hang onto her purse was knocked to the ground and dragged about 10 feet, before the strap broke and she lost control of her belongings. The crime occurred at 11:20 a.m. Wednesday, Jan. 6 as the victim was walking in a parking lot outside U.S. Bank, 3525 W. 63rd Street. The purse contained $100 cash, in addition to other belongings. The offender fled in a four-door, beige Nissan Altima with another offender, the victim and witnesses said. The robbers were described as black men age 30-40, 6-foot-1 and 250 pounds, with dark complexions. One was wearing a black baseball cap, a beige jacket and black sweatpants. Burglars entered a home near 61st and Melvina, ransacked the premises, stole two sets of vehicle keys and stole a 2008 Chevy Tahoe and a 2014 Harley-Davidson motorcycle from the garage. The victim, a 38-year-old man, was on vacation at the time. The crime was discovered by his mother, who was checking the house. Police said they saw no sign of forced entry. Burglars pried open the rear window of a house near 53rd and Ridgeway and stole $4,000 cash, assorted jewelry, assorted hand tools, a three-foot-long antique sword. The crime was discovered by the victim, a 54-year-old man, at 2 p.m. Thursday, Jan. 7. Burglars entered a garage near 58th Place and Hamlin and stole a number of belongings from a pickup truck parked inside, including a stereo system, assorted tools, a backpack and $30 cash. The crime was discovered by the victim, a 43-year-old man, at 4:55 a.m. Thursday, Jan. 7. Burglars entered the unlocked bathroom window of a home near 60th and Springfield and stole a TV, a laptop computer, assorted jewelry, a GPS unit and assorted personal identification items, according to the victim, a 44-year-old man. The crime was discovered by his father, a 72-year-old man, at 1:30 p.m. Wednesday, Jan. 6. Burglars broke through a side window of the Burger King at 5211 S. Cicero, but apparently failed to steal anything of value. The crime was discovered by a manager opening up for the day at 4:30 a.m. Thursday, Jan. 7. Burglars broke through the rear window of a house near 46th and Karlov and stole a TV, a video game console, an IPad and three passports. The crime was discovered by the victim, a 40-year-old man, when he and his family came home at 7:50 p.m. Thursday, Jan. 7. Chicago Police are warning the community about a case of criminal sexual abuse that reportedly occurred at about 6:20 a.m. Friday, January 15 in the West Elsdon neighborhood (specifically, the 5200 block of South Pulaski). 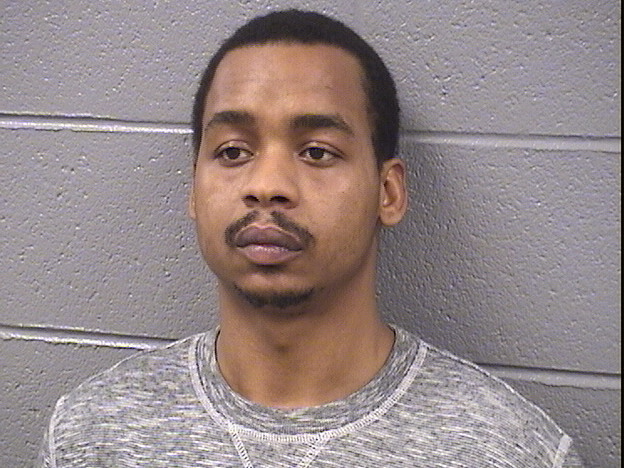 A 14-year-old girl riding a CTA bus on the way to school reported that a man "made inappropriate physical contact while making unwanted advances towards her," police said. "As the victim got out of her seat to exit the bus, the offender grabbed her in an attempt to convince her to stay." The offender is described as a Hispanic man age 20-27, 5-foot-4 and slim-to-medium build, with curly brown hair and a full beard with connected mustache, and wearing headphones, a black or gray jacket and baggy, green camouflage pants. He was carrying a book bag. 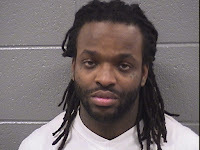 Anyone with useful information to share about the crime should call CPD Area Central detectives at (312) 747-8380 and mention case number HZ116248. • Never pursue a fleeing assailant; instead, provide the information to the police.